Just finished up my '60s Strat. Discussion in 'Guitars in General' started by ATL Strat, May 27, 2008. I just finished up my mid-60s strat creation. :BEER I've always wanted a real one, but come on, who has 10+ grand that their wife will let them spend on a guitar? It is a 3.3lb 1 piece warmoth body (ash), a '62 Allparts neck. I did the body and neck in re-ranch nitro (Sonic Blue body/Tinted Nitro on the neck). '69CS pickups and a Callaham trem. I have to say that I'm really loving it. I don't have it fully tweaked out yet, but it feels and plays great. Altogether, it is about 6.8lbs and very resonant. I went for an aged, but not totally beat-up look. I was going to do a new-like guitar, but the body fell off the hanger after one of the final coats of nitro, so I figured, what the heck. Sweet! Where did you get that reliced pickguard? Thanks. 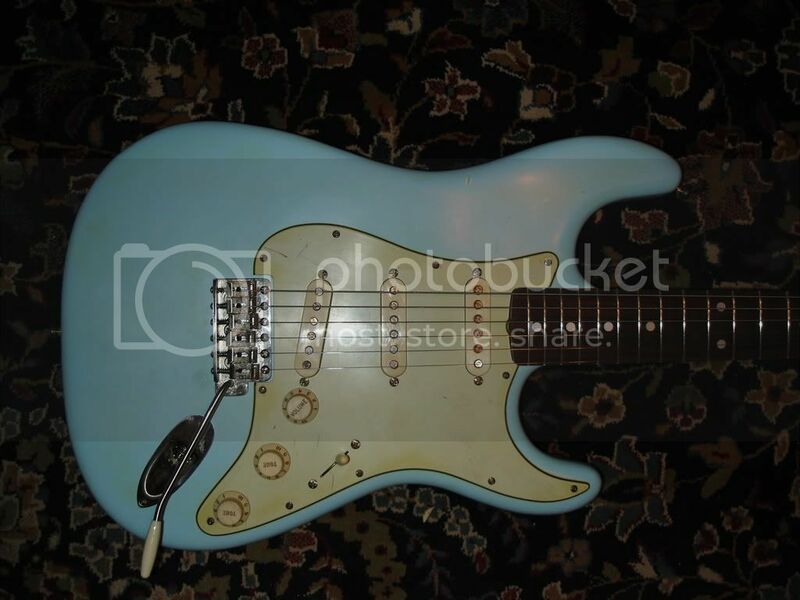 It is actually just a new Fender Mint Green '62 pickguard that I bought. I took the shine off with some steel wool and then sprayed it with some tinted lacquer. Then I used the steel wool again to take the tint off of most of it. I also put a few gouges in it with a screw driver and used a stain pen a bit around the screw holes. Then, as a final step, I mashed it around in the dirt in my flowerbed outside and then cleaned most of the dirt off with a paper towel. I'm thinking that I may need to go back and take some more of the tint off of it b/c it seems a bit more aged than the rest of the guitar. Overall, the guitar isn't a CS, Nash, or a K-Line, but I'm really enjoying it. BTW, I'm really loving the ultra-light body. My last strat was a 10+ pound 1979.
looks great! what's the neck carve like? Thanks Bmorelli. The neck is an Allparts SRO-62. It has a medium C shape to it. I really like the feel of it. It is much thinner than my '57 neck, but it still has some heft to it. I went with this one because it had the veneered rosewood board instead of a slab. I thought that it was a cool detail. By the way, for $139, I am amazed by the quality of the neck. Allparts necks seem to be the deal of the century. Hope you had fun building it and enjoy the tone. Great looking geetar! I love the color! No truer words can be spoken. You'll know you have the bug full tilt when your buying paint for projects 4-5 guitars down the road instead of finishing the one right in front of you on the bench! Very nice job! It is a sickness, trust me. You will wake up in the middle of the night and have to get online to hunt parts for the next grand scheme. Always have fun doing it and take feedback with a grain of salt. Beautiful guitar! Thats how a relic should be done IMO. I'm not into beat up bodies and such but some gently aged plastic is pretty tasty. That's one light body! Looks great!! How many coats of colour and clear did you end up using? What is the difference between a veneered fretboard and a 'slab'? Thanks guys. I really is a blast making these things. After looking at some examples on Danocaster's and K-Line's sites, I went back and rubbed the guitar out to a gloss last night (Micro-Mesh and McGuires). I'll have to take some pics and put them up -- I like it better with some shine along with the wear. By the way, one thing that I did with the Sonic Blue finish was to spray a bit tinted lacquer over it. At first I wanted to cry because I turned it into a green finish (I really wanted blue). With some elbow grease, I rubbed it out to the point where you can hardly tell that the tint is still there in some places -- I do like it this way b/c it gives the blue less of a brand new guitar look. It would be fun to go right ahead and build another, but I've really got to spend my time (for a while) playing the guitar instead of making it. Veneered rosewood is thinner. It is curved at the top near the nut. Nice looking guitar. I agree with you on the pickguard. The original green guards aren't really yellowed like that. Thanks. I forget now as far as coats go, but I started with a white primer layer so the blue would take quickly. I think it was 3-4 passes of blue and another 3-4 of clear. I wanted to keep it thin so it would age quickly and wouldn't be bogged down with finish. Looks really good. 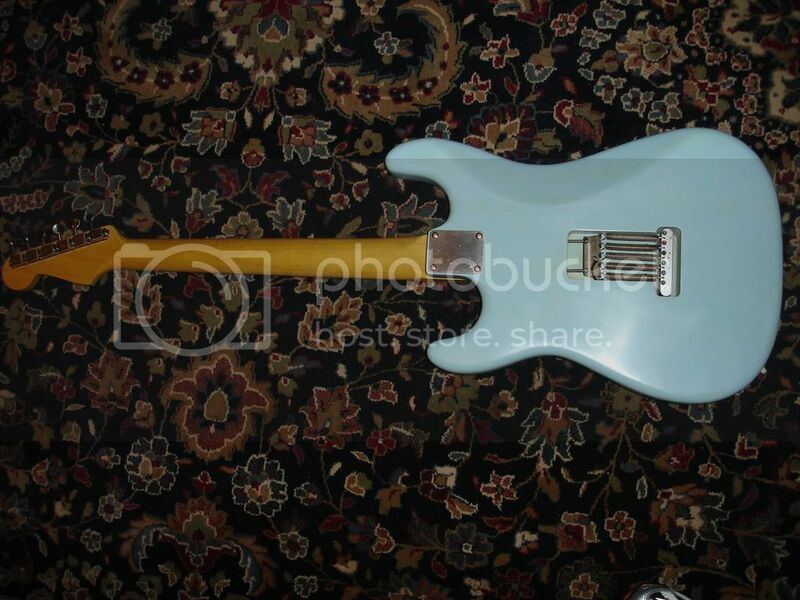 Did you get the sonic blue finish from reranch or somewhere else? killer job! add some clay dots are you have finished! Thanks. 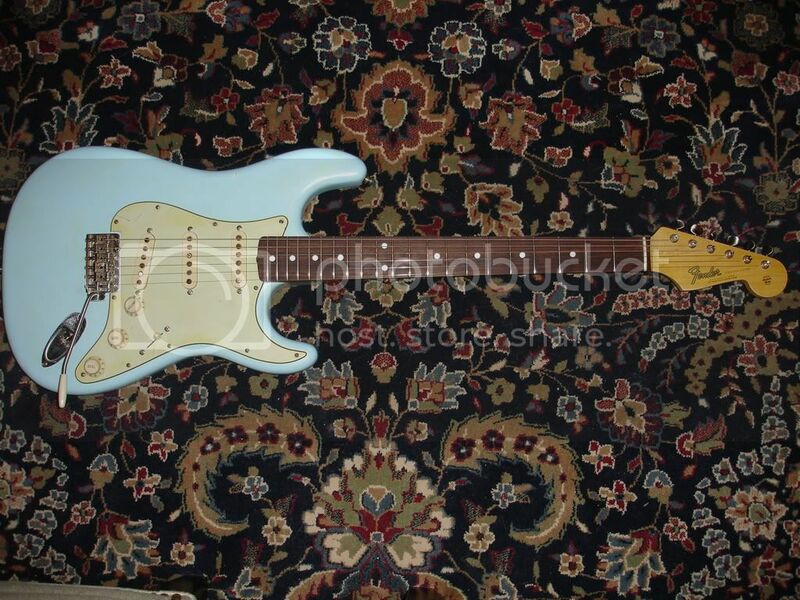 It is actually just a new Fender Mint Green '62 pickguard that I bought. ..... Then, as a final step, I mashed it around in the dirt in my flowerbed outside and then cleaned most of the dirt off with a paper towel. Beautiful job! Congrats on putting together such a great looking guitar. I'm curious. How much $$ do you have in the guitar? If you don't feel like sharing that info, understand.